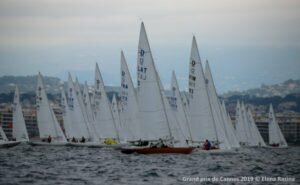 After the opening day’s sunshine the rain and squalls of day two at the Dragon Grand Prix Cannes were less than welcomed by the 51 International Dragon sailors taking part in the first event of the 2019 Dragon European Cup series. 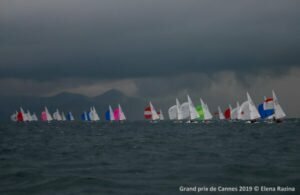 The leaden skies were initially accompanied by very light winds and the race committee was forced to postpone racing, initially ashore and then again afloat once the fleet had sailed out into the Golfe Juan race area – the easterly of the two available courses. Attempts were made to run two races but only one could be completed, with the second being abandoned more than half way through. The winner of the completed race by a whisker was Portugal’s Pedro Rebelo de Andrade, who beat Dragon stalwart Tommy Müller, a former Dragon World, European and double Gold Cup Champion by a whisker on the final leg. 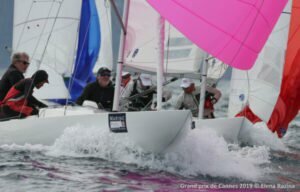 Müller makes a welcome return to international competition after a couple of seasons break, sailing with a new crew of 2001 Dragon World Champion Phillip Malte and four time Olympian and three time Star European Champion Markus Koy. Müller has clearly lost none of his old touch and his second today combines with yesterday’s two fourths to put him into a five point overall lead. In second overall is fellow German Markus Brenneck, who is crewed by Olympic silver medalist Ingo Burkowski and the legendary Jochen Schumann, three time Olympic medalist and two time America’s Cup winner, who took fifth in the race. Britain’s Grant Gordon took seventh in the race and ended the day in third place overall, just one point behind Brenneck, although he must have been hoping for more as he was leading the fourth race when it was abandoned. In the Corinthian Division for all amateur crews Sweden’s Karl-Gustaf Löhr continues to lead fellow Swede Martin Palsson with Germany’s Maximillian Dohse remaining in third. For Pedro Andrade and his team of top Portuguese dinghy sailors Goncalo Ribeiro and Joao Vidinha de Costa, a race win is familiar territory, but for their fourth crew member 13 year old Kasey Marfo it was a very special day. Marfo is part of the Scaramouche Sailing Project which uses sailing to develop the potential of pupils from the Greig City Academy, located in the London borough of Haringey, one of the most deprived boroughs in the city. Started by geography teacher John Holt, this initiative has brought sailing to young people who would never otherwise have had the opportunity and it has demonstrated the amazing benefits the sport can bring to young people. 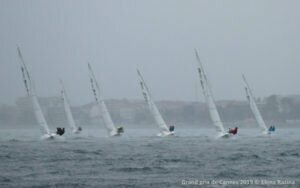 Holt and Andrade met by chance at a regatta and Andrade was so impressed with the project that he invited them to join him for regular winter training in his fleet of Dragons in Vilamoura. Kasey is one of several children who have subsequently been invited to race with Andrade’s team and in addition Project Scaramouche have been offered the long term use of a Dragon in Cowes. The grin on Kasey’s face said it all at the end of the day! Looking at the day’s races in detail the story opened with postponements. Eventually, at the third time of asking and under black flag, race three got underway with a clear line in light drizzle and a north easterly of around 9 knots. If anything conditions were even more difficult to read than the opening day and it was Müller who made the smartest choices up the first beat to lead at the first weather mark by half a boat length from fellow German Stephan Link with Hungary’s Ferenc Kis-Szôlgyemi in third and Portugal’s Pedro Rebelo de Andrade, the 2017 Dragon European Champion, fourth. With the wind up and down in strength as well as shifting this leading pack battled it out but held their places for the next two legs. On the second run Andrade was to the right and timed his gybe perfectly to slip into the lead as he rounded the port gate buoy. With a reduced final beat he held his lead to the finish. Müller crossed second with Monaco’s Jens Rathsack third and Kis-Szôlgyemi fourth. 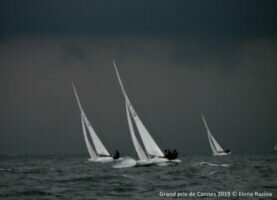 The rain began to set in in earnest but the wind looked to be holding and the committee rolled into race four, hoping to complete ahead of the approaching thunderstorms. Initially things looked promising and Britain’s Grant Gordon led the fleet comfortably for the first lap and a half, but on the second run things began to unravel and with boats pointing in all directions the race committee made the decision to abandon and sent the boats back to harbour. Back ashore the Yacht Club de Cannes once again demonstrated why its world renowned as one of the circuits most hospitable clubs with a delicious and much needed post sailing meal and a warm and most importantly dry welcome. The regatta continues until Friday 5 April with a total of eight races scheduled. The forecast for day three sees a welcome return of the sun with strong westerly winds. 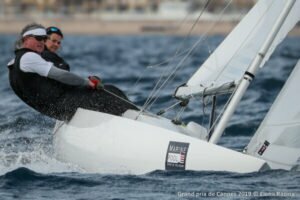 German 470 World Champion Tanja Jacobsohn showed the 50 strong fleet how it’s done with some wonderfully consistent sailing at the opening day of the Dragon Grand Prix de Cannes on the Cote d’Azure, France. 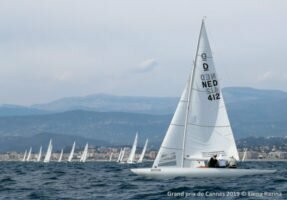 This first event of the Dragon European Cup 2019 has attracted an extremely strong field from 16 nations across Europe and as far afield as Japan. The first of the day’s two races went to Britain’s Grant Gordon with Holland’s Pieter Heerema taking race two, but it was Tanja Jacobsohn’s 3, 2 scoreline which triumphed to give her a three point overall lead. Gordon came seventh in the second race to put him onto eight points overall and into second place on countback from Germany’s Thomas Müller in third, who was also very consistent with a pair of fourth places. Fellow German Marcus Brennecke is in fourth place counting ten points with Heerema slotting into fifth on eleven points. Behind Gordon second place in race one went to the Russian team of Yevgen Braslavets with Jacobsohn, who is crewed by husband Bernard Jacobsohn and Jan Scharffesser, third, Müller fourth and Switzerland’s Hugo Stenbeck fifth. Despite his excellent start Heerema lost ground and crossed the line in tenth place. Heerema and his crew of Lars Hendriksen and George Leonchuk are seasoned players though and went into race two determined not to make the same mistake twice. They led from the off and were never seriously challenged, Jacobsohn meanwhile had to battle the pack for her second place with fellow German Marcus Brennecke taking third and Müller his second fourth. Russians Dmitry Samokhin and Anatoly Loginov were fifth and sixth respectively, finishing just ahead of Gordon in seventh. In the Corinthian Division for all amateur crews Sweden’s Karl-Gustaf Löhr is leading fellow Swede Martin Palsson with Germany’s Maximillian Dohse third. Back ashore the crews enjoyed some of the Yacht Club de Cannes famous hospitality with a delicious post racing paella party. 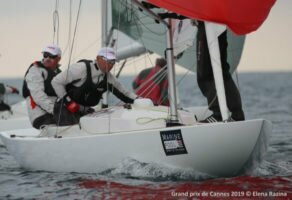 The après sailing gatherings for this year’s Dragon Grand Prix Cannes have been generously sponsored by Yanmar, sponsors of the 2019 Dragon Gold Cup, which will be held in Medemblik from 9 to 14 June. Racing continues until Friday 5 April with a total of 8 races scheduled. The sailing instructions indicate that two races will be sailed each day, but with the forecast threatening very strong winds for Thursday the Race Committee has elected to post an amendment which gives them the option to race up to three races on day two of the competition. The forecast for day two is for a lot of rain but good winds, with racing due to start at 11.30am. 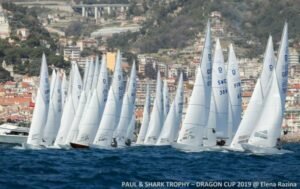 33 boats enjoyed Italy’s Ligurian coastline sailing 7 quality races over 4 days, at the Paul & Shark Dragon Cup in San Remo. There is no doubt the 90th Dragon Anniversary is in good hands and will be “Festival of Celebration” at this excellent location from October 5th to 11th. Winners of Race 1 ITA 77 Yvgeni Braslavets, Sergey Pugachev & Sergey Timokhov. From the very first race ITA 77 made a statement by just squeezing out GER 1207 at the finish to take the victory. It was as close as any finish could be, but saw Yvegeni continue his recent success in Palma and set the tone for the rest of this Paul & Shark Dragon Cup. In race 2 a big gain was made by EST 16 tacking out to sea (which is not normally the preferred direction in San Remo) as the Race Committee set courses further away from the land. This lead was maintained by Mihkel Kosk and his new Estonian crew and there were no happier sailors afloat when they crossed the finish line.. Winners of Race 2 EST 16 Mihkel Kosk, Pearu Pold & Helle Vain.. Great Result Mihkel! 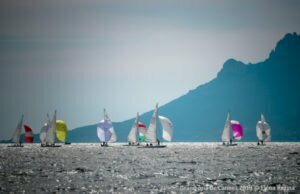 This event was also part II of the Italian National Championship it was sailed in good spirits, extremely well organised both on and off the water providing all participants maximum sailing time in a variety of conditions. Yacht Club San Remo showed why it hosts so many top International events, providing the complete package for any Sailing Championship and will be ideal for our 90th Anniversary later in the year. Many Corinthian teams enjoyed the sailing conditions and none more so than “popular” Sami Salomaa who eventually took the title with his team of Kalle Pihl & Jari Bremer, well done guys. Corinthian Winners & 6th overall were FIN 91 Sami Salomaa, Kalle Pihl & Jari Bremer. Overall it was a fantastic battle which went all the way down to the wire, due to the amazing final day of Ivan Bradbury’s “Blue Haze” recording a 1st & 2nd to finish level on points! But, on count-back, Yvgeni’s three race wins against Ivan’s two, (how close is that?) gave his Yacht Club San Remo team of Sergey Pugachev & Sergey Timokhov the victory. Many congratulations to these amazing sailors. Yvgeni Braslavets, with San Remo President Beppe Zaoli, Sergey Pugachev & Sergey Timokhov. At his winning speech Yvgeni thanked his team, all the helpers and volunteers of Yacht Club San Remo and said he was looking forward to returning for 90th Anniversary in October. He acknowledged the Race Committee had set excellent courses and complimented his main competitors Ivan Bradbury, Lars & George on such close racing which kept the final outcome in doubt until the very last seconds of the final race! 2nd overall GBR 375 “Blue Haze” Ivan Bradbury, Lars Hendriksen & George Leonchuck. Finishing 3rd in this competitive field were the the “Double” European Champions and former Gold Cup Winners RUS 27 “Annapurna” helmed by Anatoly Loginov, crewed by Vadim Statsenko and Alexander Shaligin. They fought hard, recording three 2nd places and one 3rd but could not quite top the leader board on this occasion. Such was the quality of the two leading boats. 3rd Overall RUS 27 “Annapurna” Anatoly Loginov, Vadim Statsenko & Alexander Shaligin. Also having another very good regatta was top Lady Helm Nicola Friesen despite having to put up with her excellent tactician Vincent Hoesch feeling under the weather all week complaining to us all how ill he felt 🙂 So very well done to Nicola and her GER 1207 team “Khaleesi” for this performance. 4th Overall GER 1207 “Khaleesi” Nicola Friesen, with Vincie Hoesch & Frithjoff Kleen. Meanwhile the Italian National Championship title (combined Alassio & San Remo scores), was won by ITA 76 “Yanez” Giuseppe Duca crewed by Jean Sebastian Ponce & Vittorio Zaoli. Very well done to this top Italian Team. Italian National Champions ITA 76 Giuseppe Duca, Jean Sebastian Ponce & Vittorio Zaoli. With ITA 77 & GBR 375 sharing 5 race wins between them the final race winner was MON 2 Jens Rathsack, Frederico Melo & Diogo Pereira. Jens also sailed well in race 2 & 3 and is beginning to show the form he had at last years Europeans in Hungary. Winner of race 7 MON 2 “Jeanie” Jens Rathsack, Frederico Melo & Diogo Pereira. p.s. Many Thanks to Elena Razina for these superb photo’s, see more on her F.B. page. Vilamoura Winners Stephan Link, Michi Lip & Frank Butzmann with Nino Shmueli (Left). 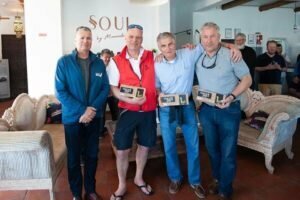 Stephan Link and his experience 2017 Gold Cup winning team won the final Vilamoura Winter Series at the weekend organised by Vilamoura Sailing with IDA International Race Officer Nino Shmueli overseeing 8 races during 3 sunny days with 10 to 14 kts of breeze. There is no doubt Vilamoura offers amazing weather throughout the winter and why Pedro Andrade has selected this Algarve “jewel” location to realize his sailing dream…. Crystal clear waters in Vilamoura for the 14 Internationals Teams in 5th winter series. IDA Treasurer Anne Vanneste & Brother Xavier with Andy Beadsworth lead at Mark 1. With PRO Nino Shmueli running the races (approx 50 mins) the turn around from race to race keeps the competitors alert and on their toes. Then ashore the local seafood, regional wines & refreshments keep everyone happy, making this winter program a great success. 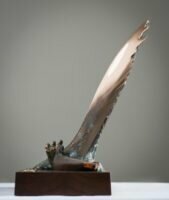 Runner up overall was the beautiful Pedersen & Thuessen of Ivan Bradbury “Debutant” (Formerly FIN 50), sailing with Lars Hendriksen & George Leonchuck. Ivan and his team put together some very consistent results over the 3 days to finish just ahead of Marcus Brennecke. 2nd overall, Lars Hendriksen with Ivan Bradbury (Helm) & George Leonchuck. 3rd overall Ingo Borkowski, Marcus Brennecke (Helm) & Jochen Schumann. 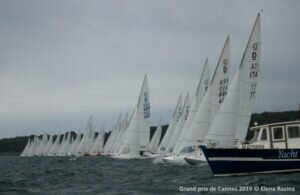 All 14 boats will now move up to Cascais for a winter series event followed by the Grade 1 Juan Carlos Trophy early May. 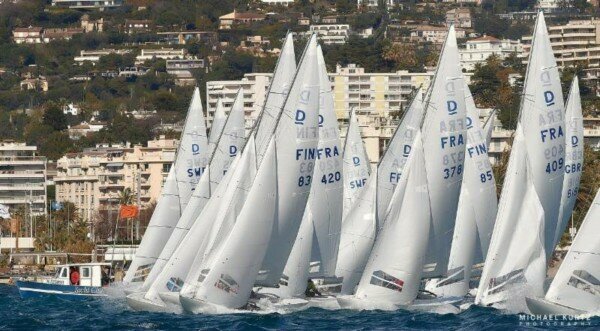 Meanwhile, many Dragons based in Cannes and Italy will attend the popular Italian National Championships in San Remo. As the Yacht Club of San Remo will be hosting the prestigious 90th Anniversary of our wonderful class in October, this will give the organizers a chance to pre-welcome many Dragon Sailors to this excellent Liguria venue. I look forward to assisting the Race Management Team and writing more reports during the regatta from 14-17 March, whilst ashore Tatiana Kurbatova will organize things to her usual high and efficient standard. The “Winners take it All” the Top 3 Teams, plus 1st Corinthian & 1st Classic Team. Presented by CEO of Puerto Portals, Corinna Graf (in Green). A total of Six Races were sailed over 15th, 16th & 17th Feb, in glorious sunshine, cloudless skies with light easterly winds and late afternoon sea breezes. All 26 teams enjoyed a fantastic time both on and off the water with the Race Management Team from Club de Regatas Puerto Portals providing excellent courses, perfectly set lines and clear VHF communication. After race refreshment was also provided by this well situated friendly Sailing Club/School making the whole event very appealing for future winter racing…. ITA 77 “Bunker Prince” helmed by Yvgeni Braslavets dominated in Palma. From the onset ITA 77 “Bunker Prince” followed their victory of the Puerto Portals Winter Series by winning race 1, race 3, race 5 & race 6 giving Yvgeni Braslavets and his team of Sergey Pugachev & Sergey Timokhov another well deserved victory. It was great to see many new faces joining the fleet as sailors from other classes experienced for themselves the fun of Dragon Sailing. Also, many teams have Family members on board learning the intricate skills of boat tuning and sail trim. One young Lady in particular experienced something that many sailors can only dream of…rounding the windward mark of a race in first place! Yes 14 year old Maria del Mar Lopes crewing for her Father Carlos in POR 69, led at the top mark of the final race and held on to finish 3rd. 14 yr old Maria del Mar Lopes leads around the top mark of Race 6 in POR 69. 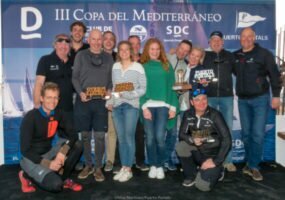 The two other teams finishing on the “Podium” was GER 1207 “Khalessi” helmed by Nicola Friesen, crewed by Vincent Hoesch & Frithjof Kleen on 22pts, followed by ESP 71 “Gunter” helmed by Javier Scherk, crewed by Miguel Angel Santaursula & Pedro Andrade with 23pts. 2nd Overall GER 1207 “Khalessi” Nicola Friesen, Vincent Hoesch & Frithjof Kleen. 3rd Overall ESP 71 “Gunter” Javier Scherk, Miguel Angel Santaursula & Pedro Andrade. 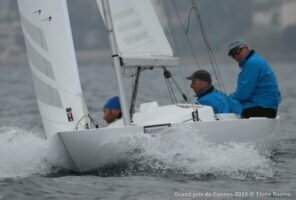 The top Corinthian Team and finishing a very creditable 6th place overall was SWE 375 helmed by Martin Palson, crewed by Peter Lindh & Thomas Wallenfeldt. Martin and his crew put together a good series finishing with an excellent 2nd place in the final race. Best Corinthians were SWE 375, Martin Palson, Peter Lindh & Thomas Wallenfeldt. It’s always great to see variety in our wonderful class and the Spanish Fleet have a number of Classic Dragons racing on a regular basis. The maintenance required to keep the boats looking so beautiful is always justified when you see the rows of Dragons all sparkling in the Marina. On this occasion the top Classic Dragon was NED 190 “Dragonera” sailed by Arjen Bouwmeester, Lotte Bouwmeester & Joren Dieben, very well done to all. This was a very well structured regatta and my thanks go to all the main Puerto Portals Organiser’s (Pepe’ Vidal & Alvaro Irala Rivero), the Marina Staff, Helpers and Volunteers. I thoroughly enjoyed my time assisting Marta Reynes and her Race Management Team of the Regatas Puerto Portals & look forward to many more races in this wonderful location. P.S. Thanks once again to Nico Martinez for many excellent action photos. The beautiful Marina of Alassio, will host part one of Italian Nationals later this month. More and more Dragons are arriving in Vilamoura here we see the 8Dimension V6’s. Dragons safely at rest in the beautiful Puerto Portals Marina, Palma de Mallorca, Spain. 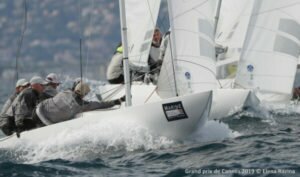 2019 Italian Championships “Alassio” Feb 22-24 Followed by “San Remo” March 14-17. Higher, Faster, Longer….. Warmer………. Stavros.